Of the 98 career Sprint Cup victories scored by the Wood Brothers, most have come as no real surprise as the team has a history of fielding fast Fords and employing some of the sport’s greatest drivers. But some of those victories were rather surprising. Over the next several weeks, Wood Brothers Racing will look back at some of its more memorable unexpected triumphs. The Woods’ first superspeedway win, in the fall of 1960 at Charlotte Motor Speedway, was an eye-opener for many. Brothers Glen and Leonard Wood had proven to be a formidable force on the short tracks of the NASCAR circuit, as Glen Wood had driven the team car to three wins earlier that season on the tight, quarter-mile oval at Bowman Gray Stadium in Winston-Salem, N.C.
Superspeedways were another matter, as Wood much preferred the shorter tracks and disliked the superspeedways. For the inaugural National 400 at the then-new Charlotte Motor Speedway, the Wood Brothers decided to put track co-owner and long-time friend Curtis Turner behind the wheel. But Turner had his hands full with his track-owner duties, so the brothers turned to Alfred Bruce “Speedy” Thompson to drive the No. 21. At that time, many in the sport figured Thompson was no longer the driver his nickname suggested. He hadn’t won a race since 1958 and even though he was just 34, many considered him to be too old to return to his winning ways. But, as the Woods proved with other older veterans over the years, most notably the Silver Fox David Pearson, winning with a veteran indeed was possible. For that race, the Woods prepared a 1960 Starliner. It had been wrecked in its first life as a street car but was rebuilt by the Woods. Auto Sales and Body Co. in Martinsville painted the car, and Leonard Wood prepared the engine. Once Thompson got behind the wheel for practice, Glen Wood knew he had a good thing going. “He was running as fast as anybody,” Wood recalled. Leonard Wood said Thompson ran a great line around the 1.5-mile oval. “He’d drive into the corners high, and stay there a lot longer than it seemed like you ought to, then he’d drop down low,” he said. In the race, Thompson ran with the leaders most of the way, and the Woods showed early signs of the pit-road innovation that would eventually lead to them becoming known as the creators of the modern pit stop. Gas man Ralph Edwards was quick on refueling, although the equipment of the day was antiquated by today’s standards. At that time, teams used a gas can made by welding two five-gallon cans together and fashioning a spout on the top. The fueler had to pour the gas into the tank opening in the center of the rear of the car. Leonard Wood and his brother Ray Lee Wood changed tires, while Delano Wood jacked the car. 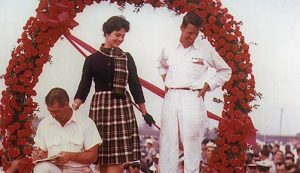 Thompson took the lead for good when Fireball Roberts wrecked after leading 197 laps and led the final 35 circuits to get the Woods’ first-ever win on a superspeedway. At the finish, he was a lap ahead of runner-up Richard Petty and third-place Ned Jarrett. The Woods teamed up with Thompson the following week for a race at Richmond, where Thompson led 173 of the race’s 200 laps to get the Woods’ fifth Cup win and the 20th and final one of his driving career. The Charlotte win was a major one for the Woods, as team owner Glen Wood explained. Then, the money earned the following week at Richmond, which included a $2,500 appearance bonus from track promoter Paul Sawyer and the $800 winner’s purse, made a big difference as well. “Those two races really got us going,” he said. Thompson ran just eight more races in the series now known as Sprint Cup and began racing on the short tracks around North Carolina. During a Late Model race at Metrolina Speedway in Charlotte on Easter Sunday in 1972, Thompson’s car stopped on the track. He was found to be not breathing and died en route to a hospital. He would have turned 46 the next day.